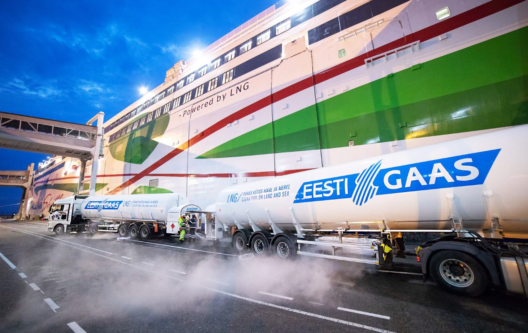 It has been two years since Eesti Gaas started supplying the “Megastar” ferry, which shuttles between Tallinn and Helsinki, with liquefied natural gas (LNG), and bunkering was performed for the 1,500th time during the night today. In two years, Eesti Gaas has delivered a total of 28,300 tonnes of LNG from various suppliers. Last year, more than 16,000 tonnes of LNG were supplied while the supply amount had been 12,300 tonnes a year earlier. Kalev Reiljan, member of the board of Eesti Gaas, can already see an increase in the amount of LNG sales at the very beginning of this year. “We are now the sole bunker supplier for the Megastar, so our sales of LNG are bound to keep growing this year as well”, Kalev Reiljan said. “It was the for jubilee 1,500th time that bunkering was performed by Eesti Gaas in Tallinn Old City Harbour during the night today”. Captain Tarvi-Carlos Tuulik, head of Tallink’s vessel servicing division, added that Eesti Gaas had been bunkering “Megastar” with liquefied natural gas for two years after the commissioning of the ship, and cooperation had been smooth. “While our LNG used to be supplied both by Eesti Gaas in Estonia and Skangas in Finland, starting this year, we will be opting for deliveries by Eesti Gaas because we can be sure of the security of supply by Eesti Gaas as well as the high quality of its LNG, and we prefer bunkering in the port of Tallinn during the overnight stay there”, Tarvi-Carlos Tuulik noted. Eesti Gaas purchases LNG in Russia, Finland, Poland and Lithuania. “Our company is currently the only one in the Baltic region to have established continuous LNG supply for its customers. In the long term, we intend to further increase our capacity for supplying LNG. In 2020, we are going to commission a new bunkering vessel in the Baltic Sea, which will be providing services to the Megastar in addition to other clients”, Kalev Reiljan said. LNG (liquefied natural gas) is a clear, colourless and odourless liquid produced by means of cooling down natural gas to approximately -160 degrees. LNG is essentially a form of transporting natural gas. In the process of liquefication, the volume of the gas is reduced to 1/600th compared to its gaseous state, which allows natural gas to be delivered to sites and areas which are not connected to gas pipelines. LNG is an environmentally friendly fuel which allows the content of carbon dioxide and NOx in emissions to be reduced remarkably and produces almost no soot particles or carbon monoxide emissions.